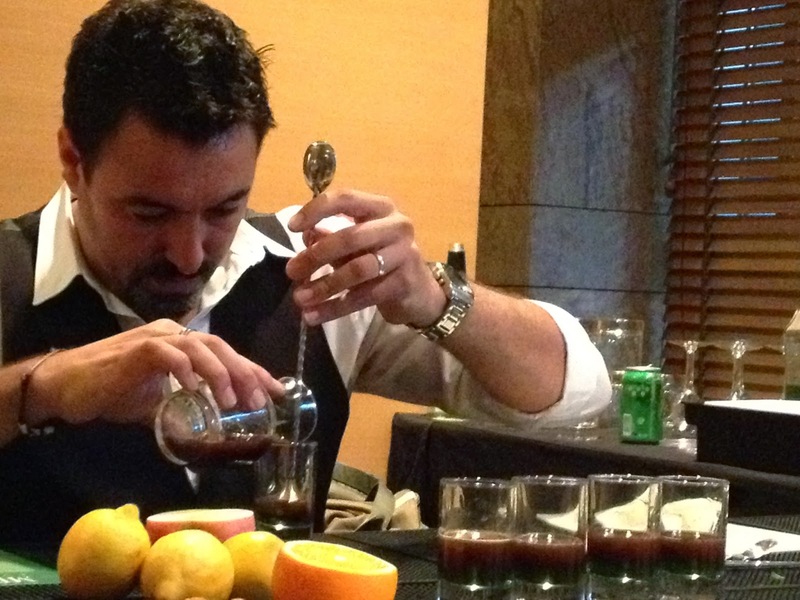 Manuel Terron has over two decades of experience in this hospitality industry and is considered the leading authority in Australian bar-tending. He has numerous articles to his credit on the history, production as well as the use of spirits and the creation of cocktails - targeted at those tending bars to consumers. He was recently in Bangalore as the brand Ambassador of Midori for an event. Here is an e-mail interview with this interesting man. Innovation is integral to mixology. How do you start creating a new drink? I think they probably start with a concept, like making a drink around tea ice balls or flavour combinations, like fruit and herbs for me. Mixology involves style – how would you describe yours? That's funny because I did an article recently about the resemblance between bartenders and artists, which also tend to have styles to their craft. With me I think I'm about to start a dark period and hold off creating cocktails for a while. But this comes after my savory period where I concentrated on working with more savoury ingredients like carrot, beetroot, herbs, salt, vinegar, meat stocks, avocado and chilli sauces. Before that I went through a tea flavoured ice phase that I will return to soon so I can better flesh out the idea. Have you ever had to create an impromptu drink for a fussy customer? Describe what happened? Yes always! when I was permanently behind the bar. But there was a recent time during Whiskey Live! in Taipei. We had several events a day when attendees were invited to come up and pull the arm on a slot machine (poker machine) to determine what flavours I needed to use to make them a cocktail. The choices were fruity, sour, bitter and sweet, using Midori as a key component. At one point we had a woman that came up, cranked the slot machine and when she tried the drink I made from her random selection didn't like it, so I adjusted the cocktail more for her taste but still found fault with it. So in front of a decent crowd I took her drink and made a different cocktail, but she still was not happy... so I gave her a shot of Japanese whiskey and thanked her off the stage. That is proof that there is just no pleasing some people! Tell us about two of your favorite personal creations… what do you like about them? The Garden Delight is beautiful because it marries lovely, subtle and refreshing characteristics in a very simple way that can be expanded into a jug form to cater for a few friends. Build into a tall glass over ice. Whip the sprig against the glass to release aroma before adding to glass. Top with tonic water. The Midtown Muse, because it is a serious drinkers’ cocktail. Fashioned on the Manhattan it combines only alcohol but focuses on the whiskey, enhancing that well aged spirit with flavours inherently found in the whiskey itself. I have been making this drink for a couple of years and have found that most industry people or individuals with more educated palates really love this cocktail. For the home based mixologist – what advice do you have to make him the star of the party? Keep it simple. Also try and pick drinks that can be made in quantities, otherwise you become attached to the task of bartender and won't be able to be the consummate host. Some great options that can be made in bulk for several people are blended cocktails and sangrias. Is there a basic collection of wines we should invest in to make some innovative combinations? Fortified wines are great to mix with ports and sherries come in different varieties that can be worked in many different ways. Cheap red wine for cooking and sangria is a necessity in my home, as is a bottle of Cava or sparkling wine for the occasional cocktail with bubbles or as something to celebrate with.